When the fickle Israelite's clamored for a king, in the days of the Prophet Samuel, Saul the Benjamite, towering in stature over all the nation, was the one selected by God in accordance with the qualities desired by his subjects. He was a man swayed by moods and impulses; at one time carried away by passion, at another, plunged in remorse and despair.Twice in the fitful career of Saul, he disobeyed the direct commands of God, and because he did not restrain his impatience in the first instance, and preferred his own inclination and prospective glory in the second, he was compelled to hear from the lips of God's messenger, the decree that his kingdom would not be inherited by any of his family, but would be given to "a neighbor of thine, that is better than thou." It was with the after life of this man, chafing under the knowledge that in the sight of God he was but a nominal king, that the life of David the shepherd boy was to be strangely intermingled. At Bethlehem, the little town where Jesus the Christ was born more than one thousand years afterwards, lived a man named Jesse, who was the grandson of Ruth, the beautiful Moabitess. Jesse had eight sons, and God told Samuel that He would choose a successor to Saul from among them. Samuel's position was a peculiar one. He had rebuked the presumption of the Israelites when they asked him for a king, but he had also carried out the commands of God and granted their request. 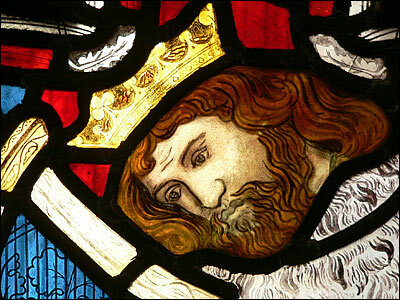 The one chosen had proved ungrateful and disobedient, and now he must go and set apart another for the kingly office. In addition to this he loved Saul, and still further, he was afraid Saul would hear of it and kill him.But God told him to go to Bethlehem and offer a sacrifice, and invite Jesse to be present. So he did this, and after quieting the fears of the elders of that place, who feared at first that his errand was not a peaceful one, he told Jesse to have his sons pass in front of him, that he might see them. Eliab, the first son, was a tall, handsome man, and Samuel thought he must be the one who was to rule over Israel. 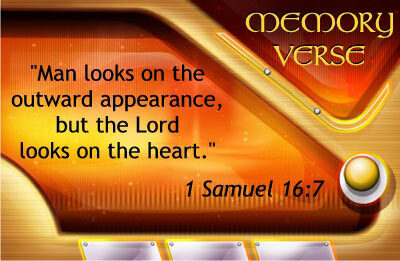 But God told him that "man looketh on the outward appearance, but the Lord looketh on the heart." Then one by one the sons of Jesse were brought forward, but Samuel said, "The Lord hath not chosen these." Then Samuel asked Jesse if he had any more sons; and Jesse replied that he had seen all except David the youngest, who was in the fields, tending the sheep. Samuel ordered David to be brought, and when he came, "ruddy, and withal of a beautiful countenance, and goodly to look to," the Lord told Samuel to anoint him, for this was the one He had chosen.Many years before, God had prepared Joseph, a shepherd boy, for a special work in connection with His chosen people, and now He had selected David, another shepherd boy, to rule over them. The records of what happened to David immediately after than memorable day in his life say little about him, but we can imagine the boy going back to the fields and flocks, and taking care of the sheep as he had been doing. How much he was affected by the ceremony through which he had passed, we do not know, but we are told this: "The Spirit of the Lord came upon David from that day forward." We next hear of David in the house of Saul, King of Israel, and this is the way it came about. Saul was unhappy and full of gloomy thoughts. 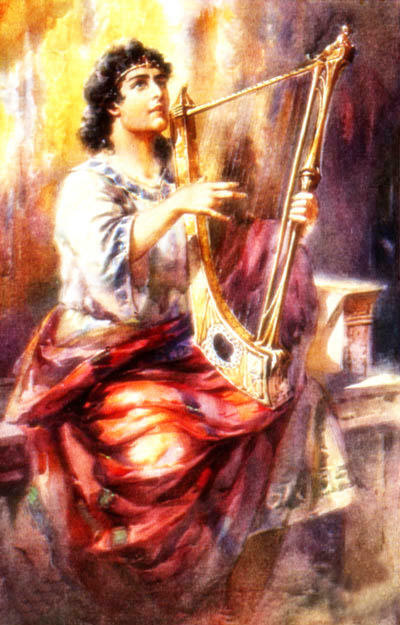 Knowing the power of music to soothe a distressed mind, the servants of Saul proposed that a skillful musician should be found; one who could quiet the unhappy king in his melancholy moods; and one of them added that David, the son of Jesse, could play sweetly upon the harp. This plan of having a skilled musician in his family pleased Saul, and he sent messengers to Bethlehem, commanding Jesse to send David to him. When the boy arrived, Saul was very much pleased with him, and soon came to love him greatly. He made him his "armor-bearer," in order to have him near his person; and when he was in his gloomy moods, David would play upon his harp, and drive away Saul's despairing thoughts. About this time Saul prepared to resist an attack from the Philistine, one of the Israelites' most inveterate enemies. There was almost perpetual warfare between the two nations; first one would be victorious, and then the other. In one battle, which had taken place during the time that Eli the High Priest was Judge of Israel, the Philistine had captured the Ark of the Covenant, a chest which Moses had made at the command of God, to hold the "tables of stone" upon which the Ten Commandments had been graven by the hand of God Himself. The Ark was usually kept in the Tabernacle, or place of worship, but on this occasion it had been taken to the camp of the Israelitish army, in the hope that its presence would inspire the soldiers, and so help to defeat the enemy. But the battle went against the Israelites, and the Ark of God fell into the hands of a nation who worshipped idols. The Philistines kept it for seven months, but as one misfortune after another followed them while it was in their possession, they were glad to send it back to the Israelites. Now, upon the sides of two mountains, the army of Saul and the army of the Philistines were facing each other, with a valley between them in which was a dry watercourse or brook. There had been no fighting yet, but twice every day, at morning and evening, a champion of the Philistines had come out of their camp and defiled the Israelites. His name was Goliath, and his home was in the city of Gath. For forty days this giant Philistine had appeared and shouted a challenge for any one to come out and fight him, but from Saul down, every man was afraid to accept his defiance. Three older brothers of David were in the Israelitish army, but for some reason which we do not know, David had left Saul's house sometime before, and was again tending his father's flocks in the fields of Bethlehem. One day Jesse sent David to the camp on the mountain side to inquire after the welfare of his brothers and to take them food. And this brings to mind that Joseph's father once took him from his flocks and sent him on a similar errand. David reached the army just as Goliath was shouting his accustomed challenge. He talked with his brothers and other soldiers, and they told him how no man in the army dared to go out and fact this terrible Philistine, although the King would richly reward any one who would overthrow him. It is probable that David made up his mind then that he would fight and conquer this idolater who defiled the "armies of the living God," and said he would do so, for soon he was summoned before Saul, and once more stood in the presence of the King he was to succeed. He must have changed considerably in appearance, for Saul did not recognize him. "The Lord that delivered me out of the paw of the lion, and out of the paw of the bear, he will deliver me out of the hand of this Philistine," and Saul replied, "Go, and the Lord be with thee." Then Saul put his armor upon David, and gave him his sword; but David told him that he could use neither the helmet, the coat of mail, nor the sword. Then, in his usual dress, with only a staff and a sling in his hands, he went to meet the mighty champion of the Philistines. He stopped at the brook long enough to select five smoother stone, which he put in the bag, which, like all shepherds, he carried and then went straight on to meet Goliath, who was coming towards him, shouting loud curses and threats. Then he called to Goliath that he was going to kill him and cut off his head, so that all the world might know "that there is a God in Israel." Then David took one stone from the bag, placed it in his sling, and hurled it at his foe. One stone was enough. Straight as a rifle-ball cleaves the air, the stone from David's sling struck Goliath in the forehead, and the boasting, blasphemous Philistine pitched forward on his face and lay there, dead. Then David stood upon the body of Goliath, and, in the presence of both armies, cut off his head with his own sword. As a great shout went up from the Israelites at David's exploit, the whole Philistine army, horrified at the death of their champion, turned and fled, and soon Saul's army was pursuing them with such dreadful slaughter than the dead and wounded lined the way for miles and miles. David put the armor which he had stripped from Goliath in his tent, and then, with the Philistine's head in his hand, he was taken to Saul, who asked him, "Whose son art thou, young man?" And David answered, "I am the son of thy servant Jesse the Bethlehemite." Saul must have been surprised to hear this, but for a long time afterwards David lived with him, and went no more to his father's house. From this time, Jonathan, the oldest son of Saul, and natural successor to the throne, began to love David as a brother, and David returned his affection as brothers rarely do. The Bible says, "The soul of Jonathan was knit with the soul of David, and Jonathan loved him as his own soul." As a proof of his great love, Jonathan gave David the robe which he was wearing, his girdle, his sword, and even his bow. He was noted as a most skillful archer, and his exploits with the bow were known far and wide. So, when he parted with his favorite weapon, it was a proof that his love for David was so strong that he wished to show it in every possible way. Once more in the house of Saul, David received the highest marks of the King's regard. Saul made him one of his generals, and sent him repeatedly against the Philistines, who continued to be very active enemies of the Israelites. 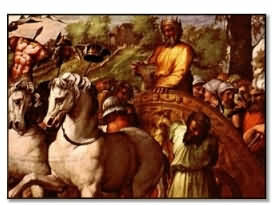 David was always victorious, and in consequence became highly popular, both with the army and the people. As time went on, Saul's pride in David's exploits and successes gave place to jealousy. It is not unlikely that he suspected that the man who performed such wonderful deeds was that "neighbor of thine, that is better than thou," of whom the Prophet Samuel had told him. His fits of madness, for they were scarcely less, began to return, and on one occasion he threw his javelin, or short spear, at David while he was trying to soothe him with the music of his harp as he had formerly done. But David escaped injury, and Saul pretended that he was sorry for what he had done. Saul was afraid of David, and soon began to deprive him of his honors. He took away his rank of general, and made him "a captain of a thousand" only. This this made no difference in David's conduct towards him. He behaved wisely, performing his duties well, and making no complaints. Seeing this, Saul sent him on a dangerous expedition, hoping that he might be killed, but David returned victorious and soon afterwards married Saul's daughter, Michal. 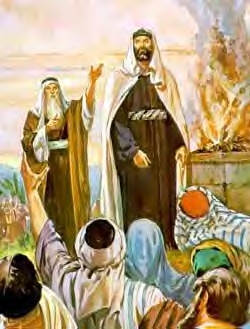 David was then at the height of his popularity as a young man, and Saul had reached the point where he made no secret of his intention to kill David. He even instructed Jonathan, and all of his servants, to kill David at the first opportunity. Instead of doing this, Jonathan told David of his father's intentions and persuaded him to hide himself for a while. Then he went to Saul and talked to him about David. He reminded him that David had taken his life in his hand when he went out to meet Goliath the Philistine, and of his many other services to the nation. He told him how brave and good David was, and begged his father not to take his life. This appeal to Saul's better nature moved him very much, and he promised Jonathan that David should not be killed. He even went farther and restored David to his place about his person. After this, war with the Philistine broke out once more, and David led an army against them and defeated them with great slaughter. Then Saul's anger and jealousy broke out again, and in one of his mad fits he attempted David's life, just as he had done before, when David was playing on his harp before him. Then David, feeling that his life was no longer safe in Saul's service, fled by night to his own house. Saul sent soldiers there to kill him, but Michal, his wife, helped him to get away through a window. So David escaped from Saul, and went to Samuel, who was still living in his house at Ramah. Even there, Saul sent soldiers to take him from the prophet's house. He sent them on three separate occasions, and once he went himself, but God protected David, and Saul's plans came to naught. After these four attempts upon his life, David stole away from Samuel's house and went secretly to see his friend Jonathan, and they had a long talk together. David was greatly grieved because Saul pursued him with such enmity, and Jonathan comforted him by saying that he would find out if his father persisted in his intention to kill him. So David hid in the fields while Jonathan went away on his errand of kindness. Just at this time one of the national festivals or feasts was to occur, and Jonathan knew that David would be missed if he were not in his usual seat. The first day Saul did not mention David's name although his seat near him was vacant, but on the second day he asked where David was. Jonathan made an excuse for him, and then Saul's anger blazed out against his son. At first he cursed him because of his friendship for David. Then he sneered at him for allowing David to live, when, by killing him, his own succession to the throne would be made secure. He swore that he would have David's life, and when Jonathan asked, "Wherefore shall he be slain? what hath he done?" he threw his javelin at him. From this, Jonathan knew that his father had fully determined to kill David; so he got away as soon as he could and went to a great rock called Ezel, where he had arranged to meet his friend. He told David what his father had said and done, and after making a vow of perpetual friendship, they separated; David to hide himself from Saul's anger, and Jonathan to go back to his father's house. Although loyal to David, Jonathan was also a dutiful son to Saul. He was brave as well as generous, and in the almost continual battles with the Philistine he greatly distinguished himself. Father and son fought side by side in this warfare until the day when they both perished on Mount Gilboa. David went first to the city of Nob, where the Tabernacle was at that time, and Ahimelech, the priest, gave him food and the sword of Goliath, which had been kept in the Tabernacle since the day David slew him. Then David went to Gath, a Philistine city, where he was recognized. He pretended to be insane, and so got away with his life. Then he took refuge in the cave of Adullam, where many who were in distress or discontented, ro in debt, joined him, and in this way he became the leader of about four hundred men. Fearing that Saul would take vengeance on his father and brothers, David arranged with the King of Moab to let them stay with him until, in his own words, "I know what God will do for me." David was now an outlaw, but God protected him, and one occasion sent a prophet named Gad to warn him that he must leave the cave and go to that part of the country where the tribe of Judah lived. So David left the cave and made his home in the forest of Hareth. One day Saul found out that Ahimelech had given David food and the sword of Goliath. So he had Ahimelech and all the priests of the Tabernacle brought before him, and accused Ahimelech of conspiring against his King. 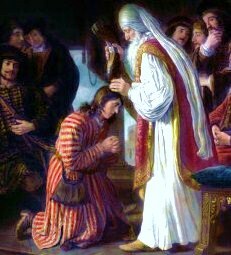 The good priest replied that he had done no wrong; he had simply helped David when he was in need because he was the King's most faithful servant and also his son-in-law. Saul was so angry when he heard this that he told his guard to kill not only Ahimelech, but all the priests that were with him, but they were afraid to touch the holy men and would not draw their swords. Then Saul turned to a man named Doeg, an Edomite, and ordered him to kill the priests. Doeg was a very wicked man and glad to do this for Saul, so he killed every one of them -- eighty-five in all. Soon after this David heard that the Philistine had taken Keilah, one of the cities of Judah, and he asked God if he might go and punish them. God told him to go, and David and his little band of men retook the city and took a great deal of spoil from the Philistine. Saul's pursuit of David was relentless, so when he found out that David was in Keilah, he arranged with the men of that city to deliver David to him. David heard the intended treachery in time to escape with his band of followers, which had grown to about six hundred men. He once more made him home in the woods and mountains, where Jonathan visited him and comforted him. Again Saul found out where David was hiding and hunted him from place to place, but just then his inveterate enemies, the Philistine, invaded his lands, and he was obliged to turn his attention to repulsing them. Meanwhile, David found a new home in the wilderness of En-gedi. When he had driven away the Philistines, Saul, with an army of three thousand men, went into the wilderness in pursuit of David. At one time he went into a cave to sleep, not knowing that David and his men were hidden there. David's men wished him to kill Saul, and he could easily have done so, but instead he went softly behind him and cut off a piece of his robe or coat and took it away with him. David watched until Saul left the cave, and then called to him, "My lord the king." Saul turned and saw David, who saluted him and then asked why the King thought he meant to do him harm, when he might have killed him in the cave but did not. In proof of this he showed Saul the piece which he had cut from his coat. These words melted the heart of Saul and he cried out, "Is this thy voice, my son David? Then he wept and told David that he had returned good for evil. He also said that he was now sure that David was to be king over Israel, and he asked David when that time came not to destroy his family. And David promised what he asked. It is not at all sure that David believed in Saul's change of heart, for he continued to avoid him. One day David and his men were short of food, and being near the home of Nabal, a very rich and also a very mean man, he sent messengers to Nabal asking him to give them something to eat, and also reminding him that they had protected his shepherds and great flocks and herds from wandering bands of robbers. Nabal treated the messengers roughly, asking, "Who is David?" and sent them away without any food. But Abigail, his wife, when she heard of it, prepared two hundred loaves of bread and a great deal of other food and took it to David just as he was preparing to take vengeance on her husband. So David and his men were well fed for once in their outlaw lives. After this, the Ziphites, a people who were unfriendly to David, told Saul where he was to be found, and instead of keeping his word and letting David alone, he once more set out to capture him. But David's spies led him to Saul's camp, and one night he passed the sleeping sentinels, went boldly into Saul's tent, and took away his spear and the bottle of water that was beside his pillow. Then from a hill close by he called loudly to Saul's soldiers, telling them what poor sentinels they were and showing the spear and the water-bottle he had taken from the King's tent. When Saul appeared David asked him why he continued to persecute him, and Saul replied, "I have sinned: return, my son David: for I will no more do thee harm." But David did not believe that Saul was sincere, and went away again after telling him to send some one to get his spear. He had learned not to trust Saul's most solemn promises and that he was not safe in his kingdom. This time he took his six hundred men and went into the land of the Philistines, where he lived with Achish, King of Gath, for "a year and four months." Once more the Philistines gathered together a great army and set out to do battle with Saul. David and his troops were with them, but the princes of the Philistines would not let them take any part in the fighting, fearing they would turn their arms against them. Achish, the King of Gath, spoke up manfully for David, but he could not convince the princes, and so David and his men had to go back. On the third day after this, David came to Ziklag, the city which Achish had given him, and found that the Amalekites, another heathen nation, had burned it and taken away all the women and children as captives, David's family among them. David asked God if he should pursue them, and God told him to do so. So David and his faithful six hundred men started in pursuit, but when they reached a brook called Besor, two hundred of them were so faint and tired that they could not cross it. Just then they found a slave who had been left behind by his cruel master because he was sick. He was nearly starved, but David's men gave him food, and in return for their kindness he told them which way the Amelekites had gone. David overtook them at a time when they were eating and drinking and making merry over their raid. He smote them, "from the twilight even unto the evening of the next day: and there escaped not a man of them, save four hundred young men, which rode upon camels, and fled." So David recovered all the captives, including his own family, and very much spoil. Then, driving before them their own and the captured flocks and herds, David and his men turned back. When they reached the brook Besor, a part of his band objected to sharing any of the spoils with the two hundred men who had been left there. But David ruled that those who "went down to the battle" and those "that tarried by the stuff" should share alike, and his decision became a law in the nation. He also gave some of the spoils to the men who lived in the various places where he had been in hiding. While all this was going on Saul was fighting his last battle with the Philistines. It went against him. Jonathan and his two brothers were killed, and Saul was badly wounded. In his grief and pain he told his armor-bearer to kill him lest he fall into the hands of his enemies, but this the man would not do, so Saul killed himself with his own sword. When word was brought to David that Saul and Jonathan were dead, he was greatly distressed. He broke out into poetic lamentations which have been celebrated from that day to this. He forgot all of Saul's offenses against him in his grief at his death; and in memory of his love for Jonathan, he ordered that the children of the tribe of Judah should be instructed in the use of the bow. The days of David the outlaw were now over. God told him to go to Hebron, the largest city of his tribe, and there he was installed king. In this way the old prophecy that the kingdom should be given to Judah was fulfilled, yet as long as any member of Saul's descendants lived, the succession was disputed, and there were wars between the rival houses. When Ishbosheth, the son of Saul, was slain, the last obstacle to his reign over all Israel was removed. David reigned at Hebron for over seven years, and then, having captured Jerusalem, went to live there. The original name of the city was Jebus, and it contained the strongest citadel of the Jebusites. It was so strong that the Israelites had never been able to take it up to that time. 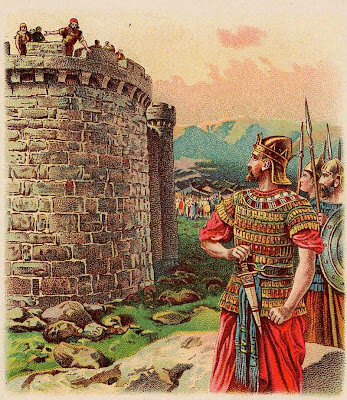 But David determined to conquer this stronghold, and did so. He offered the post of commander of all his forces to the man who would first scale the walls. His nephew Joab performed the feat, and so David gained the city. Then David built him a palace and established his family and retinue in it, and next he punished the Philistines so thoroughly in battle that they were driven to the farthest borders of their kingdom. Having relieved the nation of this persistent enemy, David's next thought was for the Ark of the Covenant, which was still at Kirjath-jearim, where it had been placed after the Philistines had returned it to the Israelites. So he set out with thirty thousand men, had it put on a new cart drawn by oxen, and started for Jerusalem. On the way, which was rough, a man named Uzzah took hold of the Ark to steady it. God was displeased at this want of reverence, and Uzzah died. Then David was afraid to take the Ark to Jerusalem, and left it in the house of a man named Obed-edom. It remained there three months, and then, hearing that Obed-edom had greatly prospered in that time, David had it taken to Jerusalem, where a Tabernacle had been prepared for its reception. But this time it was carried by priests and treated with the greatest reverence. Now David could sit in his house at peace, thankful to God for all He had done for him, and in gratitude to God he planned to build a magnificent Temple in which the Ark should have a permanent home. He took this matter to the prophet Nathan, who at first told him that God would be pleased to have him do this, but that night God spoke to Nathan and told him to tell David that he must not build Him a house, but that a son who should come after him should build it. He also told him that David's descendants should rule Israel forever. David bowed to the will of God and devoted himself to ridding the Israelites of all their enemies. He did this very thoroughly and among the cities he conquered was Gath, the home of Goliath, whom he had slain with a stone, and one of his own places of refuge when hiding from the anger of Saul. As time went on, David's favorite son Absalom rebelled against him. He was a handsome man with a great quantity of beautiful hair. The armies of father and son met and Absalom was defeated. In his flight the mule he was riding ran under a great oak tree and Absalom was caught by the hair and hung there. He was found in this plight, and killed by Joab, the man whose exploit at Jerusalem made possible the capture of the city. David mourned deeply for his son Absalom. Still later another of David's sons rebelled against him, and then David had Solomon, another son, anointed king while he himself still lived. When this was done, he charged Solomon to serve God with a perfect heart, for if he did so God would always help him. Then he gave Solomon the patterns for the Temple which he had not been allowed to build, and all the costly materials he had gathered for the work. He told him how the priests were to conduct the services when the Temple was completed, and then held a great service in which all the people joined. David died when he was about seventy years old, and was buried in Jerusalem, which is often called the city of David, where he had reigned for thirty-three years, and Solomon, his son, sat upon his throne. David was far from being a perfect man, but he was a remarkable one. He was brave, as is easily seen, generous, as proved by his treatment of Saul, affectionate and lovable, as his friendship for Jonathan has shown. His gifts of poetry and music are seen in the Book of Psalms. He did wrong and was punished, but he repented for the sin and not for the punishment. He passed away full of riches and honors, and left to his son Solomon a well-established kingdom and a dignified position among the surrounding nations.